At Long Last Anna is Launching the Animal Communication Mentorship Program in 2017! Check Out the Animal Communication Mentorship Presentation for All the Details! Art of Animal Communication Has Finally Arrived! Take Me to the Page to Sign Me UP! * Does not include travel or accommodations. Can’t make the full payment now? No worries. Use the Payment Plan below! Welcome to the Ultimate Program! This is the Deluxe, Executive, Become an Animal Communicator Package! Topics covered during the 12 days of Live Mentorship! Can’t make the full payment? No worries. Use the Payment Plan below! The Mentorship Program Begins in January. All Materials Will Be Delivered In January When the Program Begins! If you have any questions please contact us at info@reachouttohorses.com. Answering 2 of the most Important questions I’ve been asked. I’m finishing up our incredible Advanced Horsemanship event called Simple Solutions. We are having an extraordinary time and I am very proud of our trainer students. They are doing an amazing job with the horses and working their butts off! That’s right, our trainer students no longer have butts. But I digress. The reason I post this is that no matter where I go, I often get asked the same questions. Two of them in particular caught my attention and I thought they would be great webinar topics. Because they are so important and valuable, I didn’t want to wait until the end of the year for my annual webinar series. I also decided that I wanted to make this mini-webinar event VERY AFFORDABLE for everybody and give you a special gift just for joining me. That’s how transformational I believe this information can be for you, your horses, and all your animals. So, without further ado…Here you go! One of the toughest things to deal with as an Animal Communicator is the dreaded Skeptic! For an animal communicator, a close-minded skeptic can be frustrating, upsetting, and even intimidating. At times they can ruin the energy and the flow of the session, making you less effective. Just the word alone can bring up feelings of anxiety for any animal communicator, psychic, or medium alike. So how do you deal with and convert the skeptic? 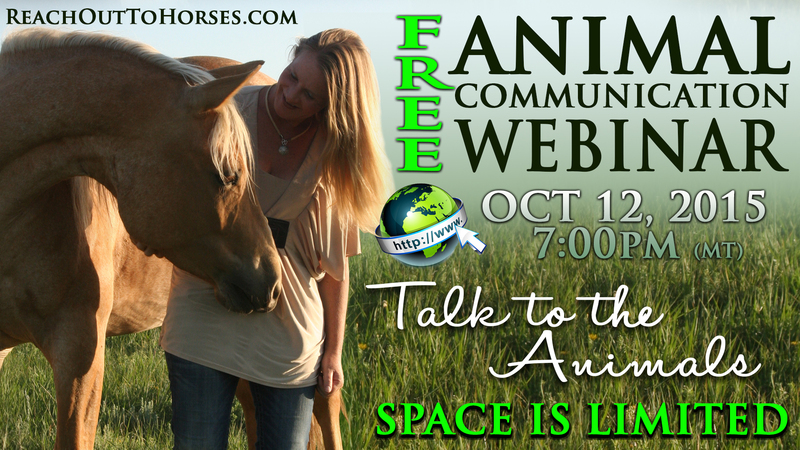 Time for Another Webinar on Horse Conscious! Anna returns to Horse Conscious next month to share her experience about the do’s and don’ts of handling horses and what horses must go through in the world of humans and how you can best support your horse! There is much controversy around this subject and Anna is ready to dispel myths, reveal her secrets and share her almost 2 decades of experience as an International Clinician and Horsewoman. To sign up for this event head here and then sign on Sunday 23!